Yoga is not only the asanas, it is a whole life philosophy. Doing the best you can for the others is one of the yogic teachings. The Green Yoga Association with their projects gives us the best and purest example of original yoga practice. We are expanding our practice of Yoga and the practice of environmental stewardship by planting fruit trees around the planet. The Green Yoga Seva Groves will offer a place where communities can gather to practice asana, meditate, cultivate and care for the trees, and share the harvest. They will do their part to lower carbon in the atmosphere and will educate the communities about sustainable agrigulture. As you know, the Green Yoga Association is a global community of yogis deeply connected to the practice of Yoga and the practice of environmental stewardship. Fruit trees will be planted around the globe, so that communities can gather to practice asana, meditate, cultivate and care for the trees, and share the harvest. This tree-planting project expands knowledge of permaculture practices that, in turn, feed our Yoga. And as we practice in the beauty of the fruit tree groves, we embody the Yoga practices that nourish our ecological action in the world. The Green Yoga Seva Groves are real life manifestations of our practice. We see the threats to our living planet all around us. Global warming, toxic chemicals, ecosystem and habitat destruction call our spirit to action. To act is our Karma Yoga. * helps us recognize our connection to everything. By widening our sphere of compassion, we glimpse the never-ending, unchanging, and pure radiance that is at the center of our beings. Bringing together the twin practices of Yoga and environmental stewardship is Green Yoga, and we hope that you will support us in this earthy Green Yoga project. Each Green Yoga Seva Grove will honor the selfless service of people who have sewn the seeds and fed the roots of our community. The first Grove honors the people whose pioneering work envisioned and cultivated our community of Green Yogis. 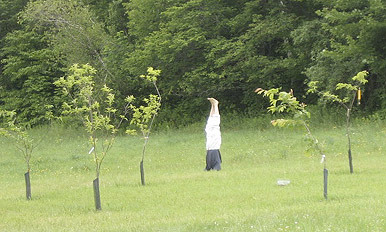 We have planted our first Green Yoga Seva Grove in the spring 2009 at Metta Earth Institute in Lincoln, Vermont. Metta Earth is an educational and experiential eco-farm and yoga/meditation center. 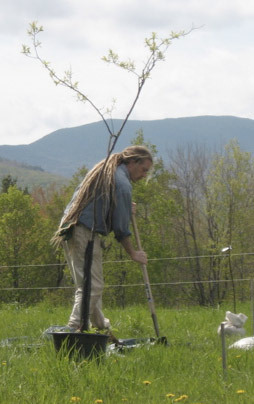 Our fruit trees came from a local, organically-certified, northern Vermont tree and plant nursery known to provide hardy, indigenous varieties suitable for this cold, mountain climate. As you can see, this project brings so much to the world-a place to store carbon, a living permaculture demonstration, an outdoor yoga educational and practice space, a community gathering spot, and a living symbol of our gratitude for those who have offered their Seva. Please support this project with your generous donation. May everyone’s work bear fruit! – Green Yoga Project is the artist that will bring some green colour to our painting.